A lot of people came to visit when I shared why most of us are not exactly the best at Instagram due to lack of hustle and effort. When someone takes the time to comment or like a few photos I will usually take the few seconds to go see their profile and immediately judge it. We all do it. Sometimes it is a good impression, but often since the majority of us don't plan the posts much, it is not. There are people out there doing it much better than us though. Let me show you some profiles that have a stunning first impression. First impressions for Instagram can be tricky. If you are like me and you just went on a trip, all your recent photos are from the vacation. In my opinion there is nothing wrong with this. At the same time it is not going to help you establish yourself as a must follow user if that is what you are looking for. 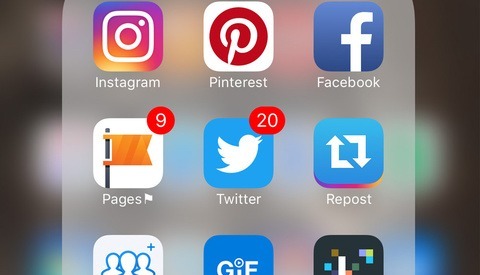 Besides good photos, having a unique feed can help you stand out and entice people to click that follow button so they can see what you post next. 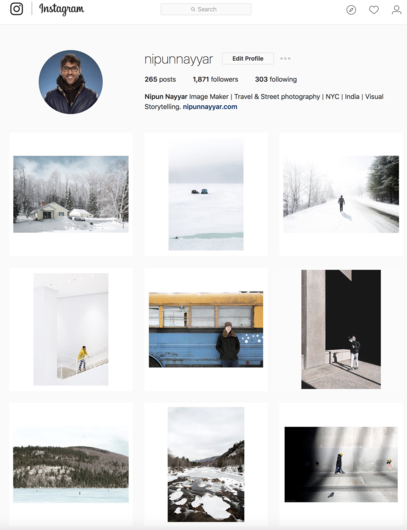 Things like consistent photo style, a strict color palette, or heavy use of white negative space have stuck out to me as the most successful profile types. Instagram has a very white user interface and tends to compliment lighter photos. This applies to colors too. I found a number of light pastel pink and blue based feeds with great looking profiles and large followings and interactions. It helps to pay attention to where your post will sit adjacently to the other posts. Too many of the same look might take away from the overall aesthetics of your profile. Users that maintain the discipline to post only black and white also stand out from the crowd. Some people start alternate accounts for only monochrome work. Probably like you, the extra management with no initial followers prevents me from trying. If you have a big enough following it is much easier to just give a shout out to the new account and gain some immediate followers. One of the profiles I came across was from an artist, Lex in NYC, with the handle @ch3m1st who was doing something very simple but effective. His posts follow a one, two, three, one, two, three, pattern. In his case it cycles through a color photo of New York City, a dark photo on black of often abstract digital art, and a color photo of New York City. This consistent and clean pattern creates columns of each style and never line breaks like the grid posting tools will. Every time a new photo is posted the column simply shifts to the right. This would be very easy for anyone to pull off and could even be expanded upon by making one of the columns cycle through it's own pattern. You could also take the column idea and apply it to rows. Three at a time of the same color scheme, location, or even zoom factors of the same image look very cool when done right. I wouldn't recommend doing too many at a time or breaking up images across multiple posts simply because they often don't stand well on their own and it floods your followers with lower quality single posts. The next profile that caught my eye was from @dimikangaroo aka Dmitry Morugov from Moscow, Russia. 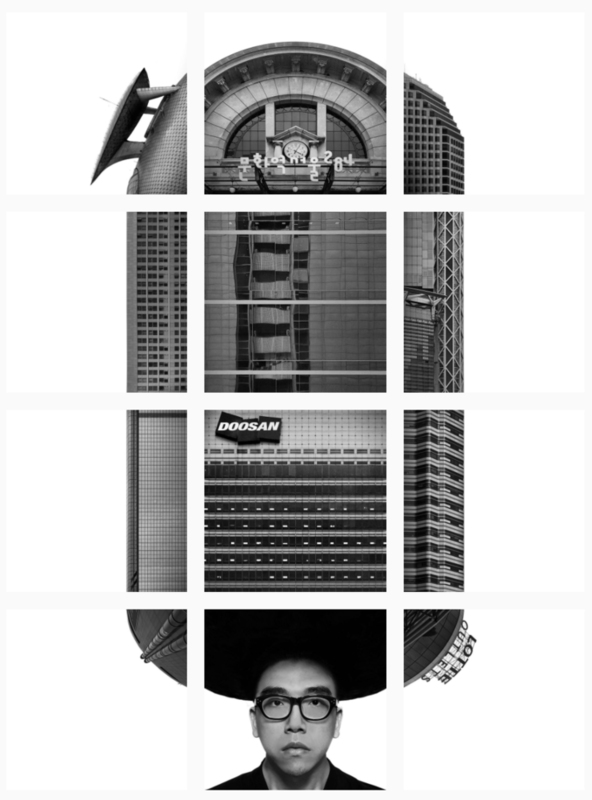 Their feed is a bit different and random but most of the shots share an otherworldly quality. The photos often use a stark eye catching color palette, and an impressive sense of scale. Also impressive here is the iPhone only aspect. 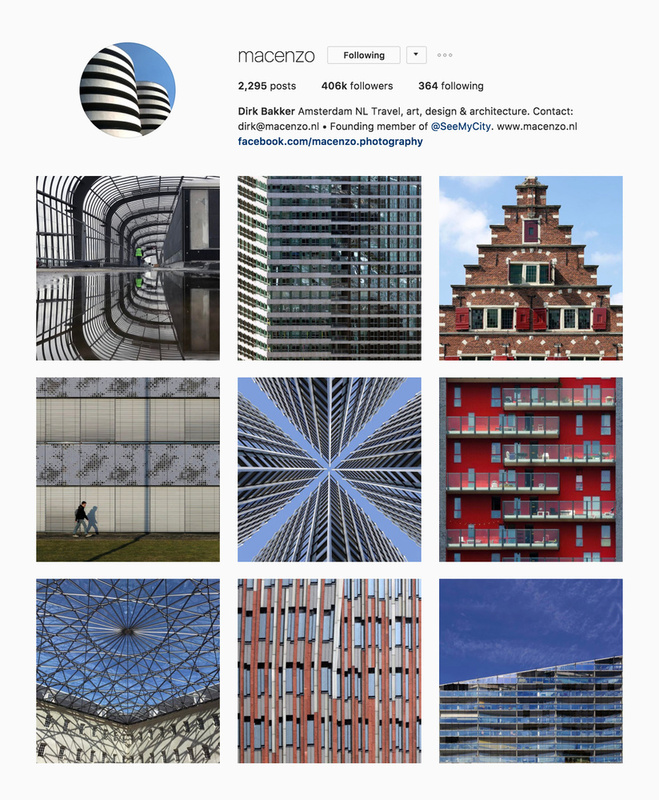 Dirk Bakker from Amsterdam, Netherlands goes by @macenzo and is a boss at filling the frame with stunning architecture and patterns that seem almost meant for each little Instagram box. His shots are all a treat to the eye and really show off some great skills of the craft. Speaking of being different, I was blown away by the creations found on Stephen McMennamy's feed @smcmennamy that reads in the bio, "I like to combine stuff." He is not kidding. The coolest part is how minimally they are constructed with just a hard edge from a similar but not exactly the same colored photo. 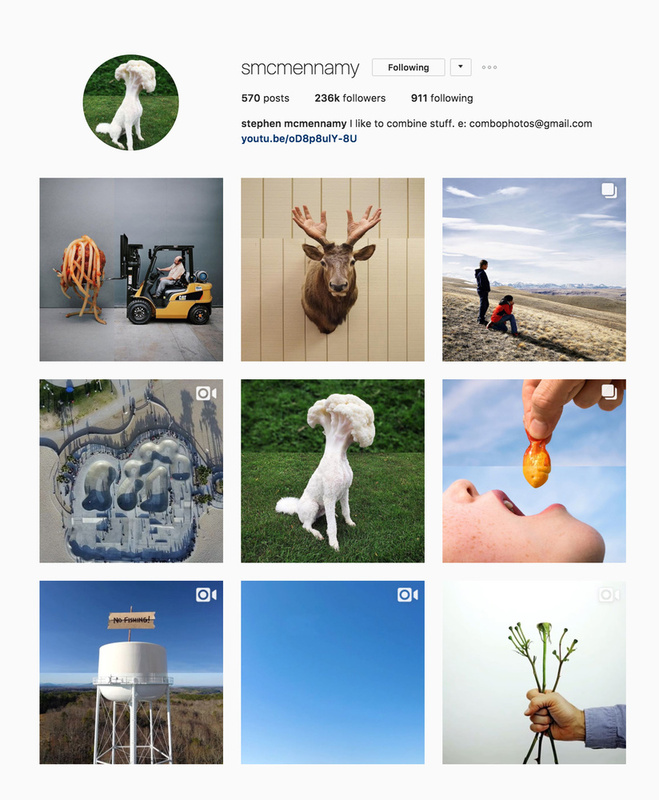 Stephen's feed is a classic example of a unique look that most people will find interesting enough to instantly follow. My favorite profile that I was able to find was by Weijiang, going by @orhganic. 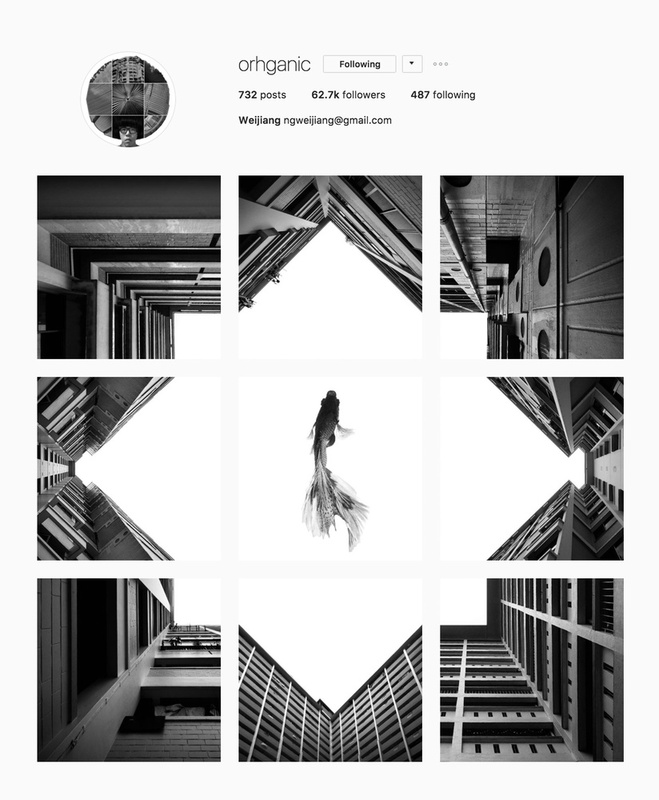 Their profile contains amazingly complex yet minimal shots that occasionally combine in the profile grid. Weijiang has actually put together the Millennium Falcon with nine separate individual posts that fit together like a puzzle. On another occasion he did a Poké Ball, and the Death Star. Don't worry if you think you can't start doing this and have to start a new account. You are only six to nine posts away from a whole new look! If you want to try any of the advanced puzzle tricks be sure to break out Adobe Photoshop and make some square grid templates. Consider starting an alternate account if you want to give this a go but don't want to give up posting those vacation photos. Better to act now before all the names are gone. Do you know of any cool Instagrammers doing unique work? Share some links in the comments. I would love to see who else is out there. Love this article. 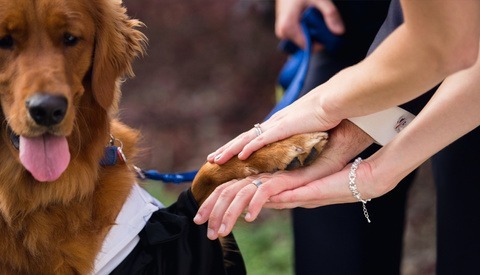 I've found that scheduling photos for posts helps in this aspect. Thanks for reading! Do you use an app for that? No app but I do export photos into a folder in an ordered way so that I know which photos to post next. Thats when I'm posting heavily. I go through seasonal low points and depending on the amount of free time I get (work full time and an full time college student) I just try to post as much as I can. Very cool - looks great! Excellent article. Very entertaining. Now following a few new people too. Thanks for reading, glad you liked! I HATE puzzle IG profiles. What's the point unless they plan to leave it like that for a long time, then create the next puzzle. I hate it big time too. Try to overcome the IG limitations when viewing content is just nonsense. We can see now IG stories with 20+ short videos with the same content because 30 seconds isn't enough. 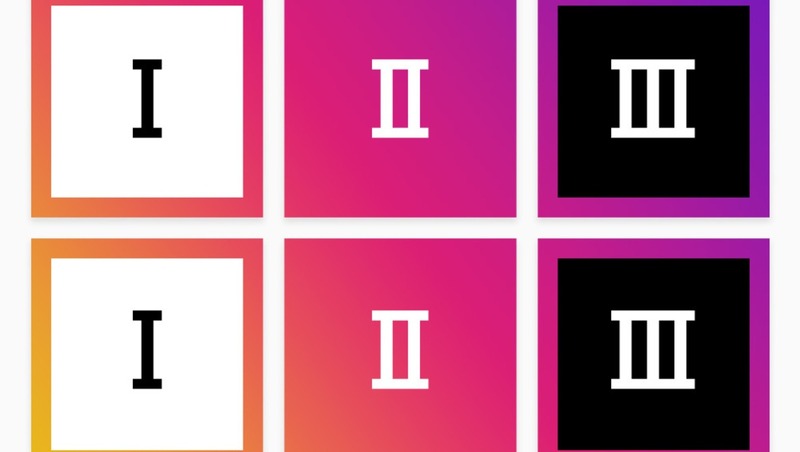 I've definitely noticed the use of color schemed in popular Instagram profiles but haven't considered the rest of the techniques you mentioned so thank you for that. 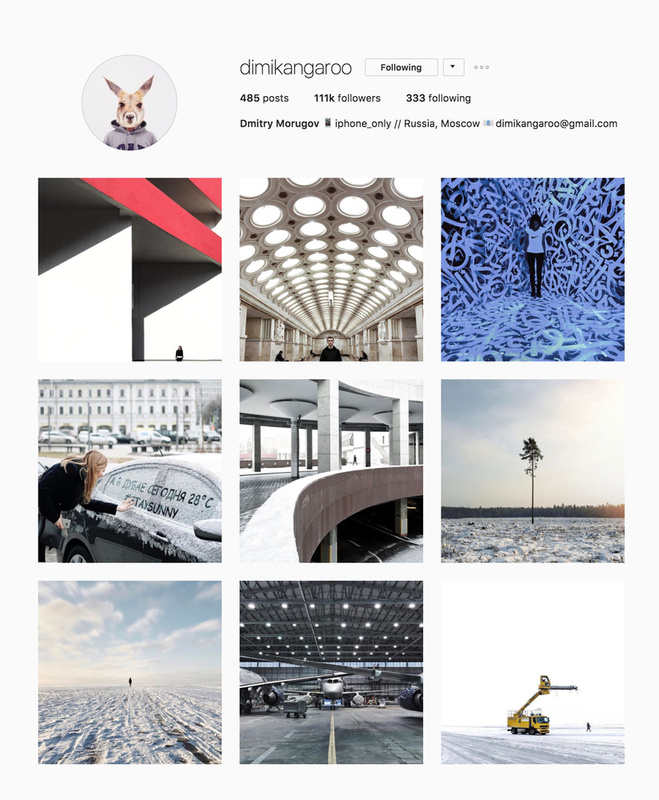 What do you suggest for someone who has already started a feed of images and wants to switch over to a pattern/theme? Start fresh with a new account or just start posting on top of the old material? Thanks for reading Scott, I would just start now unless you don't think you want to have a fresh start. Starting over certainly has it's own challenges. As soon as you post six to nine photos you will have a whole new profile look! yeah I follow another guy https://www.instagram.com/rcabadies/ who does the same thing, using 3 shots from a single shoot in a row. Really effective if you stick to it and not as overpowering as some of the users on this list. Some amazing IG pages! I'm guilty of flip-flopping all over the place with my page; I'm posting camping and outdoor shots at the moment, before that it was some fitness photoshoot final images, then it was holiday landscapes, then street portraits before that. No wonder I struggle with retaining followers!! I've tried to make my theme about my photography work but the variations in posting is noticeably taking a toll. I've plateau'd at about 120-150 likes per post, and 350-370 followers. I've got a planned video and stills climate change short film trip coming up mid year so I'll start building up to that with themed posts, cross-collaboration with the other guys coming along and try for a few features. 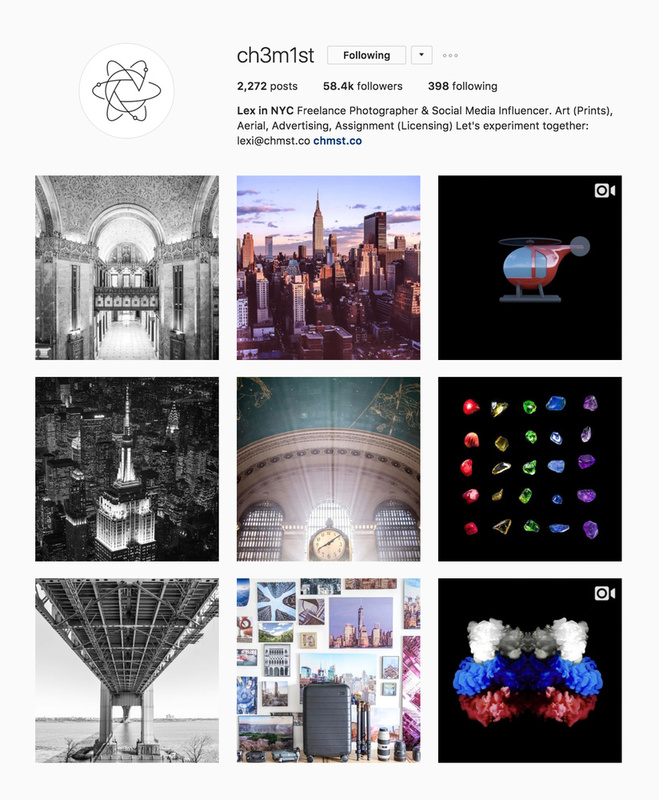 The common theme with successful IG pages is a common theme! Followers know what they're going to get. I checked out the site, looks cool but I'm an Android guy myself. The unum logo looks less intrusive at 90x90px. If you don't mind my opinion it actually looks cooler small. Thanks for reading! McMennamy reminds me of Christpher Niemann @abstractsunday. There are some really great rows you've got there! Thanks for reading and sharing your link Rasmus. Starting few weeks back, I started taking care of my profile's first impression. Works well. More than new followers or involvement, there is a definite self satisfaction in taking care of everything a visual artist must consider, including the overall view of the page. I now basically refit my images on a blank white square, which gives full image view on the feed and gives a less cluttered profile. 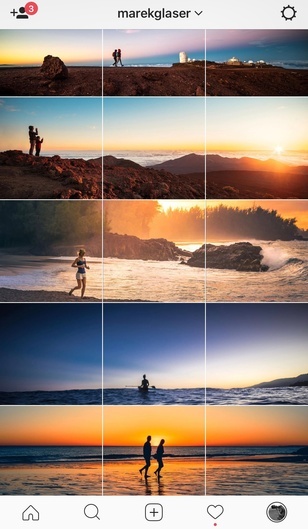 I immediately unfollow anyone who posts a single photo as a multi-image grid. 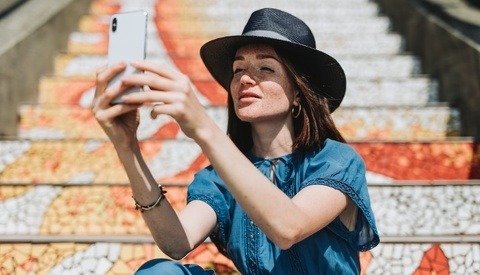 It looks cool on your profile (well, at least until you post less than three photos at a time); however, your followers don't normally look at your profile. They look at their feed, in which your broken up photo is just noise, not meaning. My approach has been to curate panoramic images from my photography collection that work as 3x1 triptychs on my profile but also work well as individual images in my feed. It's challenging. I've boxed myself into this but I guess you do that any time you go for any kind of consistency.